Students will use the plans, or blueprints, to construct a sturdy paragraph using Toobeez. Have the Toobeez ready to use. Begin by discussing what students already know about paragraphs. Record students’ existing knowledge on the board. *A paragraph is a group of sentences (usually 6-8 at the middle school level) that explain and support a single topic. * A topic sentence, or focus sentence, states the general idea of the paragraph. * A supporting sentence provides specific information about the topic sentence. * A concluding sentence restates the main idea and closes the paragraph. Challenge: Students will use the plans, or blueprints, to construct a sturdy paragraph using Toobeez. 4. Display the sample paragraph. Working in pairs, have students identify the main idea, the topic sentence, the supporting sentences, and the concluding sentence (if there is one). 5. Write each sentence on a sentence strip. 6. As a whole group, use the Toobeez to construct a paragraph “house” using the blueprints (refer to photos to help with constructing the house). 7. In building the house, students are actually working backwards. First, construct a square base which symbolizes the concluding sentence. 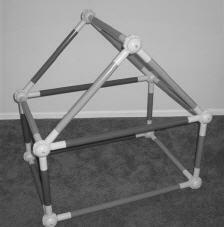 Then, attach four “supports” from each ball to start the walls and connect them to complete the cube. These symbolize the supporting sentences. Finally, construct a triangular roof to cover the house. This roof symbolizes the topic sentence which “houses” the entire topic. 8. Now attach the sentence strips to the appropriate parts of the house. 9. On an index card, write down the main idea of the paragraph. Then, hang a string from the center of the roof, and attach the index card to the string. 10. Break students into three small groups. Provide students with a new sample paragraph (Students can use copies of a new paragraph or each group can have a unique paragraph). 11. Using the Toobeez, students can construct their own Toobeez house and label the house using sentences from their sample paragraph. 12. After the activity, move to the “Activity Discussion and Processing” section of the activity. First, attach the topic sentence to the roof, and then add the supporting sentences to each vertical “support” of the house. Add any supporting sentences next to its related sentence. 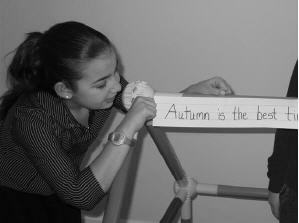 Finally, attach the concluding sentence to the base of the house. First, attach the topic sentence to the roof, and then add the supporting sentences to each vertical “support” of the house. Add any supporting sentences next to its related sentence. Finally, attach the concluding sentence to the base of the house. What are the important elements for a good paragraph? How does writing paragraphs properly benefit the reader? How did building a house with Toobeez help you to understand the concept of paragraph writing? Do you feel your group worked cooperatively? How would you rate how your group worked? What do you feel is important for a team to know in order to be successful? Why is listening and cooperation important in teamwork? 1. Making the activity a little easier. If students are struggling with the concept of paragraphs, use this lesson to help introduce paragraphs. 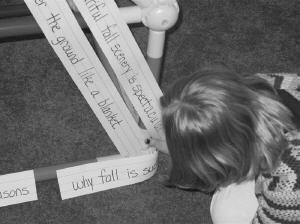 Provide students with a Toobeez house that is already labeled with sentence strips from a paragraph. Then have students write the paragraph based on the sentences on the Toobeez house. Once students grasp how the parts of a paragraph are arranged, provide students with new main paragraph ideas on index cards. Then, in pairs, have students write a 6-8 sentence paragraph based on the main idea. 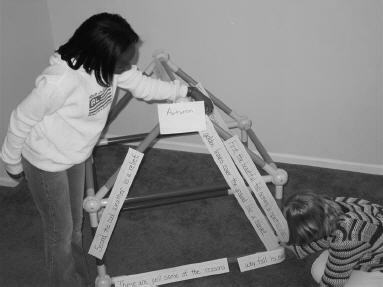 Once the paragraph is written, have students construct their Toobeez house to make sure all the parts are present. This will help students recognize when something is missing (especially the topic sentence). 3. Extension: Writing transitional phrases. To avoid the problem of choppy sentences or to focus the lesson on sentence fluency, have students identify transitional phrases within the paragraph and write them on colored index cards. Attach these index cards to the Toobeez balls. The transitions connect the sentences just as the balls connect the tubes.